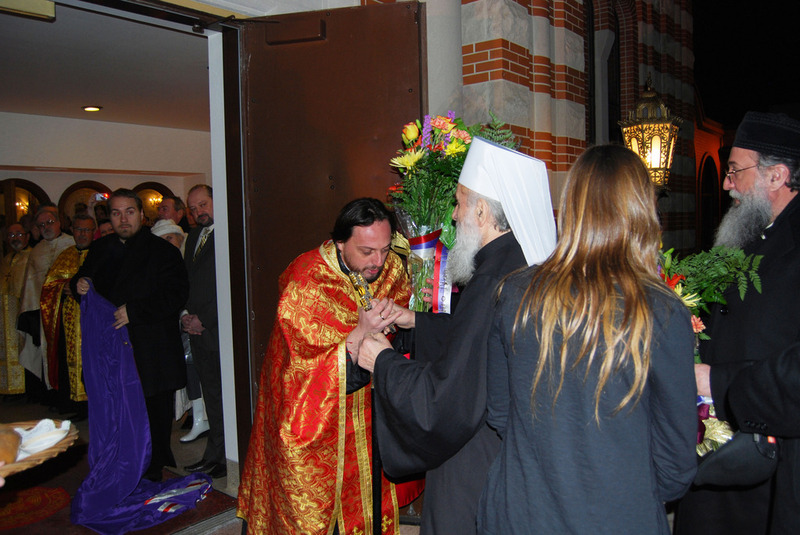 Merrillville, IN - On the eve of the feast of the Holy Hieromartyr Haralambos, on February 22, 2011, His Holiness Patriarch Irinej of Serbia, accompanied by His Grace Bishop Longin and the clergy, visited the St. Elijah the Prophet Cathedral in Merrillville, Indiana. In the full church the faithful people offered their prayers to God together with their clergy and with fear of God and a firm faith prayerfully rejoiced at the arrival of His Holiness. The clergy together with the many children and people welcomed His Holiness with the traditional bread, salt and flowers, greeting the Serbian Patriarch with the words, Blessed is He who comes in the name of the Lord. Vespers was served by Episcopal Deputy V. Rev. Stavrophor Nedeljko Lunich in the con-celebration of many clergy from the neighboring parishes of the New Gracanica-Midwest Diocese. Following the service the cathedral dean, Fr. Aleksandar Novakovic, warmly greeted His Holiness and, on behalf of the faithful people and the clergy, expressed his spiritual joy in light of this visit. Fr. 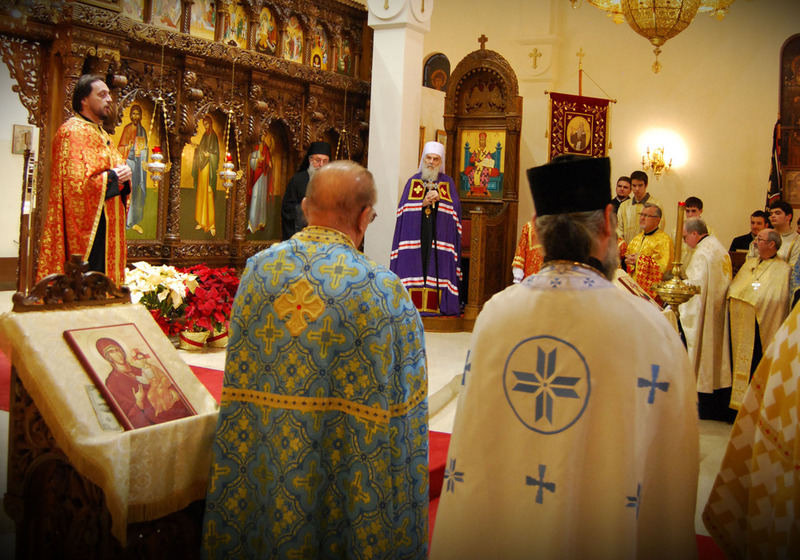 Aleksandar also stressed that His Holiness' visit is important for the spiritual progress of the Serbian people in these regions and was greatly pleased that the feet of His Holiness should walk on the holy land of the Serbian Orthodox Church of St. Elijah the Prophet and feel the selfless efforts of the founders and donors which lasted for years in building this beautiful church. At the end of his greeting Fr. Aleksandar asked His Holiness to bless the faithful with the blessings of God and with the words of faith comfort and spiritual encourage all those present. 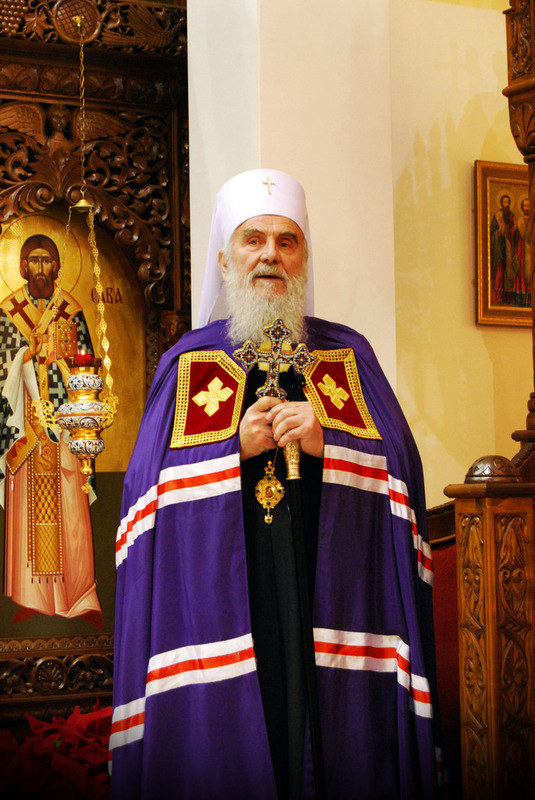 His Holiness Patriarch Irinej expressed his joy and satisfaction with his visit to the holy church and reminded all those present that it is the duty of all Christians to live according to the words of Christ and in Christ and to always make efforts that through fasting and prayer we daily strengthen ourselves spiritual and grow. His Holiness paid special attention to the unity of all in Jesus Christ and thanked God that unity of the Church of Christ in these regions is firm and stable. Also, it was mentioned that Bishop Longin has done much in bringing people together and has created a firm foundation for the spiritual progress of the church in these regions. This prayerful gathering ended with a meal prepared by the hard working members of the parish Circle of Serbian Sisters. 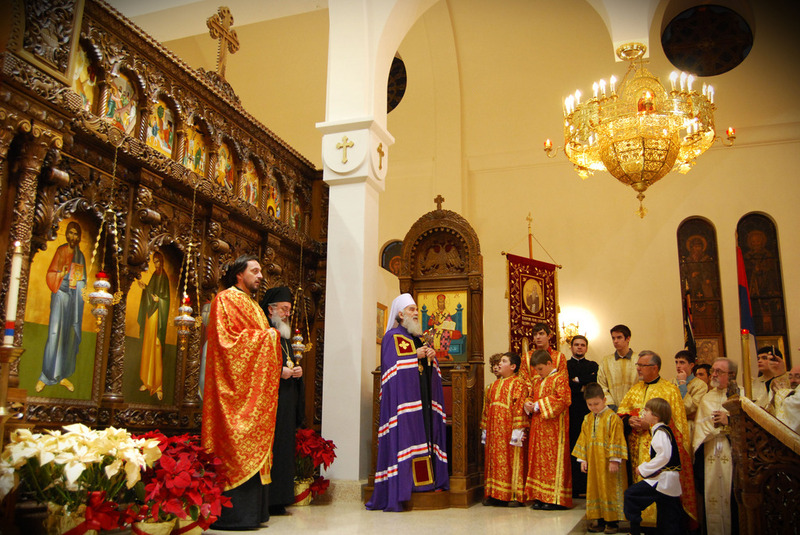 This was truly a beautiful and spiritual event at the St. Elijah the Prophet Serbian Orthodox Cathedral in Merrillville, Indiana.